These days royal and celebrity cultures are linked closer together then ever before. Royal fashion and style are a favourite pastime of many - and some royals have (rightly or wrongly) been described as style icons. (A term used inflationary in today's world, I might add.) 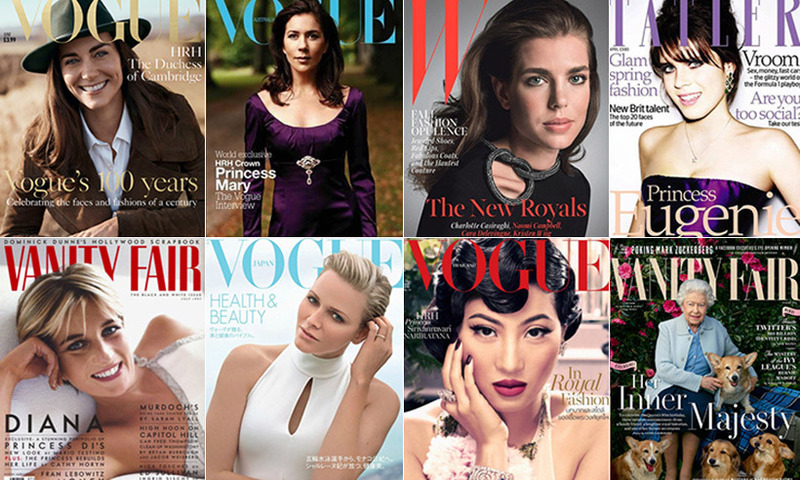 Royals are featured on the covers of Vogue, Tatler and other glossy magazines or show their life on social media. The immortal Sisi, Marie-Antoinette, Diana and a few more - of course there have always been royals who had the IT factor. Yet both worlds have edged ever closer over the 20th century and have never been as closely linked as they are in today's age. But when are royals treading just too closely with the glitz and glam world of the stars and celebrities who are famous for being famous? Let's face it, monarchy is a pretty outdated concept. In a day and age when largely anything goes, it's neither new nor original that someone based on the luck of birth becomes the head of a nation. There were good people who had that luck, there were bad people who had that luck, but for most cases they simply were regular people with faults, flaws and lots of positives. Still large parts of the media try to paint royals as this uber-human creatures because that is what they used to be: Near-divinely figures exempt from all criticism. With different forms of government available, the status of royalty has changed (at least in European nations, Asian and Arab monarchies are a different story). Every move is scrutinised by the public and the media. With modern forms of media like 24-hour-news channels, the internet and especially social media where everyone can easily share their opinion, the wheel is only spinning faster and faster. How much faster it can, who knows - and who knows the future of the European monarchies. If I had a recipe for a way forward, I certainly would not tell you but bottle it up and sell it to the highest bidder. These days, it seems that to the media and many consumers, a.k.a. royal watchers, alike the difference between royalty and celebrity has grown smaller and smaller. However, there is a difference that everyone should keep in mind. People can become famous - or infamous - for a variety of reasons. While celebrities are famous for being actors or musicians, the relative of someone or at least some Insta-fame, royals serve a purpose greater than themselves. The institution of the monarchy is more than one person. You cannot simply switch off from being royal, for better or worse. It may open doors but it can also come back around biting you in your behind for a royal is never truly private. That's not to say that royals don't and shouldn't have a private life. But as the incomparable Violet Crawley, Dowager Countess of Grantham once said, "The truth is neither here nor there. It's the look of the thing that matters." A member of a royal family represents the monarchy by virtue of their birth or marriage, no matter if they are an official working member of a royal family or not. With that comes the responsibility of being entrusted with a country’s reputation in everything they do. It's not enviable but let's not forget that there also come some perks with royal life here and there. Royals, especially those who are considered "working royals", represent a monarchy and are, as such, public servants - and the public has the right to hold them accountable for their choices, to comment, to applaude and to criticise. That's what sets royalty apart from celebrities: While we may not agree with some of the choices and behaviour of our favourite or least favourite actors, singers or celebrities who are famous for being famous, we do not have the inherent right to critique. Royalty is a different concept: They are not self-serving stars or celebrities but wander a path of duty and service to an instution that has been here for thousands of years and will probably be around after the current crop of royals has left this earth. The line between official and private will thus always be a blurred one with royalty as it is with all other public servants: Just like royalty, a politician or dignitaries will also be held responsible for choices in his private life. Being an anachronism in today's world naturally leaves European monarchies in a tough spot: They must be transparent because otherwise the public will start to ask questions, yet they can't be too transparent as not to lose the little magic from days gone by still left. They have to have the "It" factor, yet cannot be seen as the kind of celebrities who are just famous for being famous or let the monarchy become a popularity contest because, for better or worse, it relies on the divine right and luck of birth. There needs to be substance to royalty beyond fashion choices and lovey-dovey gestures, because it is at least doubtful that the monarchy can be saved one pretty dress or hand-holding at a time. Instead, the European monarchies need to move with the times and find new ways of relevance. To become more accessible to the public, some royals have chosen to give unique insights into their life via social media, extensive interviews with newspapers and magazines or homestory-like articles blurring the lines between royalty and celebrity further. While I'm not against royals using social media or feature stories in magazines to draw attention and support a cause, it certainly is a fine line to walk. Who doesn't recall those Vogue pictures of the Danish royal family all dressed up in tiaras between moving boxes from a few years ago?! It was an odd portrayal of royalty. That's not to say that a certain celebrity factor may not help for the future of the monarchies, but royals must be careful to stay above the fray to face the challenges of the decades to come.